Standing at your desk all day is healthier by far than sitting, but the commercial options tend to be expensive. 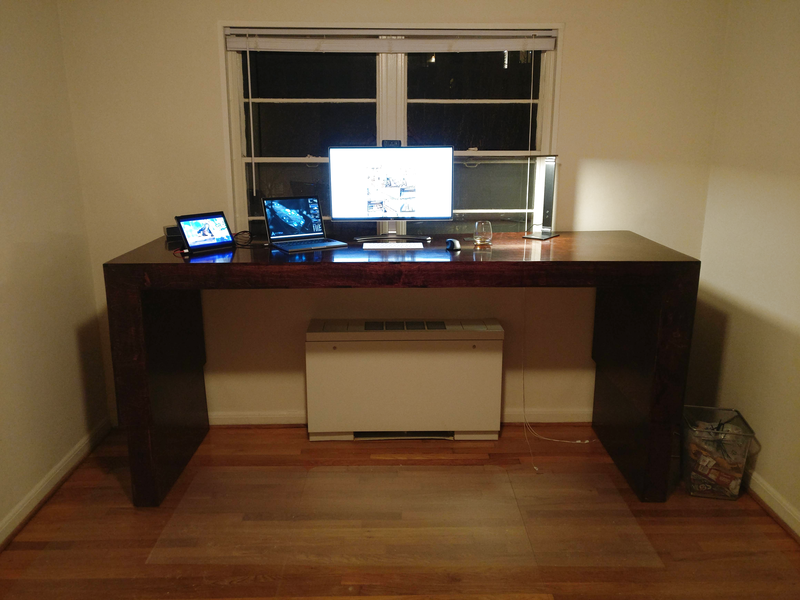 [drivenbyentropy] had to contend with a heater right where the desk would go, but building an adjustable office desk to accommodate it turned out — well — gorgeous. Two 18″ heavy duty 12 V DC actuators raise and lower the desk with a 600 lbs static load capacity and 200 lbs of lifting load each. One actuator is actually slightly faster than the other, so instead of working out something fancy, [drivenbyentropy] simply extended the cable length on the faster actuator to disguise the difference. Framed with some standard 2×4’s and sheathed with plywood, the massive four by eight foot desk has twelve ball-bearing drawer slides in the legs to add stability and smooth out height adjustments. Because of its size and having to build around the heating unit, the desk is stuck in the room since it does not easily come apart. There is, however, easy access to the two electronics compartments for troubleshooting! We’ve become used to readily available single board computers of significant power in form factors that would have seemed impossibly small only a few years ago. But even with a board the size of a credit card such as a Raspberry Pi, there are still moments when the available space is just too small to fit the computer. The solution resorted to by enterprising hardware hackers is often to remove extraneous components from the board. If there is no need for a full-size USB port or an Ethernet jack, for example, they can safely be taken away. And since sometimes these attempts result in the unintended destruction of the board, yonder pirates at Pimoroni have taken viewers of their Bilge Tank series of videos through the procedure, creating in the process what they describe as “The World’s Thinnest Raspberry Pi 3“. The USB and Ethernet ports, as large through-hole components, were the easiest to tackle. Some snipping and snapping removed the tinware and plastic, then the remains could be hand-desoldered. The GPIO pins resisted attempts to remove their plastic for easy desoldering, so for them they had to resort to a hot air gun. Then for the remaining camera, HDMI, and display ports the only option was hot air. Some cleaning up with desoldering braid, and they had their super-thin Pi. They weren’t quite done though, they then took the reader through modifying a Raspbian Lite distribution to deactivate support those components that have been removed. This has the handy effect not only of freeing up computer resources, it also saves some power consumption. You might point out that they could have just used a Pi Zero, which with its SD card on the top surface is even a little bit thinner. And aside from the question of extra computing power, you’d be right. But their point is valid, that people are doing this and not always achieving a good result, so their presenting it as a HOWTO is a useful contribution. We suspect that a super-thin Pi 3 will still require attention to heat management though. Take a look at the video, we’ve put it below the break. If you want to found a company, you’ll find pages and pages of advice scattered around the Internet telling you exactly how to do that. What if you want to found an Open Source hardware company? That’s a bit harder — you can’t do hardware as a service, and that Open Source moniker will drive away investors. [Zach Fredin] is one of the rare founders that are making an Open Source hardware company work. In 2015, he developed NeuroBytes, a system of electric neurons designed in such a way that if you get two hundred or so, you can replicate the brain of a flatworm. NeuroBytes was a finalist in the 2015 Hackaday Prize, the team received an NHS grant, and now these PCB neurons will be on the market late this year. 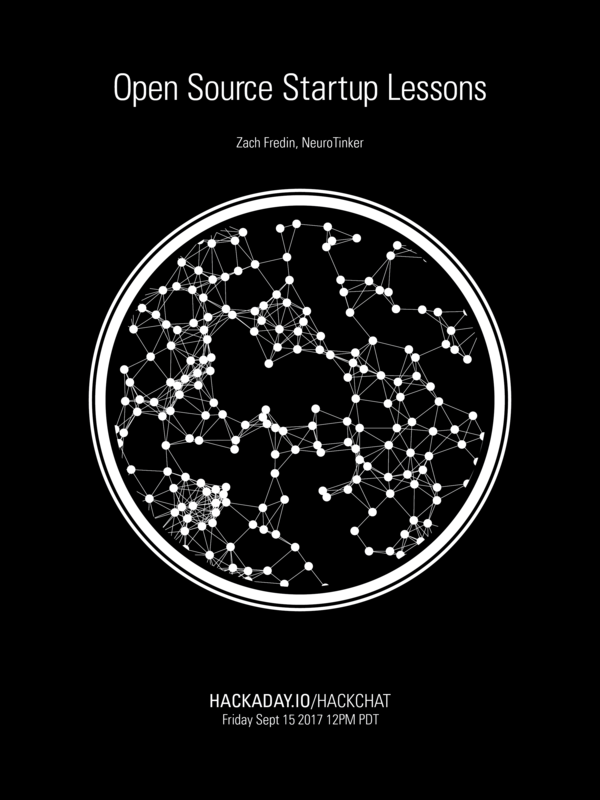 For this week’s Hack Chat, we’re going to be talking to [Zach] about the challenges about creating a company from nothing and doing it the Open Source way. Topics for this Friday’s Hack Chat will include the experience of building an Open Source hardware company, manufacturing, building a community around a product, and business spelled with dollar signs.